[248 Pages Report] The Oilfield Services Market was valued at USD 103.26 Billion in 2016 and is expected to grow at a CAGR of 3.35%, from 2017 to 2022. Increase in oil & gas exploration, growing efforts in exploring new oilfield reserves, shale gas exploration, and lifting of Iranian oil export sanction are major drivers that would trigger the oilfield services market. Global crude oil production stood at 98.24 million barrels per day in 2017 and is projected to rise to 99.90 million barrels per day by 2018 according to EIA. The global natural gas production is expected to increase from 342 billion cubic feet per day to 554 billion cubic feet per day by 2040. By 2040, shale gas is expected to account for more than 30% of the world’s natural gas production. The ever-increasing demand for fossil-based resources continues to influence the demand growth for new reserves and drilling activities across the world. These increasing drilling activities drive the demand growth for oilfield services. This research study involved the use of extensive secondary sources, directories, and databases, such as Hoover’s, Bloomberg Businessweek, Factiva, and OneSource, to identify and collect information useful for a technical, market-oriented, and commercial study of the global oilfield services market. Primary sources are mainly industry experts from core and related industries, service providers, technology developers, standard and certification organizations of companies, and organizations related to all the segments of this industry’s value chain. The points given below explain the research methodology. 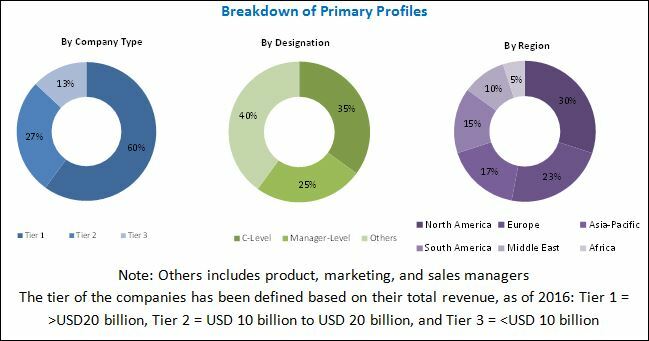 The oilfield services market ecosystem comprises oilfield services and oil & gas industry centric companies such as Baker Hughes Incorporated (U.S.), Halliburton Company (U.S.), and Schlumberger Limited (U.S.) among others; onshore and offshore application dedicated companies such as Weatherford International, PLC (Switzerland), Superior Energy Services (U.S.), and National OilWell Varco, Inc. (U.S.), among others; well intervention, plug, and abandonment to decommissioning companies such as Archer Limited (Bermuda) and GE Oil & Gas (U.K.), among others; that integrate the oilfield services and provide them to oilfield operators to cater to their unique requirements. Onshore applications are highly popular in the Middle East and North America, especially in countries such as Saudi Arabia, Kuwait, the U.S., and Canada, where the maximum number of oilfields are located onshore. As per Baker Hughes’ International Rig Count, as of April 2017, the number of onshore rotary rigs globally was 1,693 compared with 218 offshore rigs. Moreover, the onshore environment in regions, such as Europe and North America has witnessed a technology-driven revolution. The Middle Eastern and North American regions are currently the world’s largest crude oil producer, as most of the oilfields in these regions are located onshore. The increasing production activities are likely to boost the oilfield services market during the forecast period. Activities in offshore oilfield environments are comparatively more complex than onshore oil & gas fields. Offshore activities require advanced technologies, making the offshore market a capital-intensive segment. Further, the cost of oilfield services at offshore fields is much higher than onshore oil or gas wells. The increasing growth rate is fueled by new exploration & production activities being carried out in offshore areas. How is the current oil price scenario affecting the oilfield services market and what is your view on how the market is expected to perform in the coming years? What are the upcoming technologies that will have a significant impact on the market in the future? What will be the revenue pockets for the market in the next 5 years? Kindly validate the drivers, restraints, opportunities, and challenges of the oilfield services market, and let me know if I am missing anything? The global oilfield services market is projected to grow at a CAGR of 3.35%, from 2017 to 2022, to reach a market size of USD 125.51 Billion by 2022. This growth is attributed to increasing shale gas production, growing global E&P spending, and lifting of Iranian oil export sanctions. The fluctuating crude oil prices, are the major restraints for the market. The oil & gas industry is susceptible to crude oil price fluctuations affecting the demand for oil as well all its related markets. The competition between the U.S. and the OPEC countries, particularly because of the shale gas revolution, has been one of the factors for the oil price plunge in the recent years. The crude oil prices plummeted to less than USD 30 a barrel in February 2016 after having seen a peak of over USD 110 a barrel in September 2013. From July 2014, prices fell sharply and continued to be at lower level causing sharp CAPEX cuts in 2015, and 2016. The industry shifted their focus towards cost optimization and extremely thin spend on new activities effecting heavily any demand growth across upstream oil and gas activities. 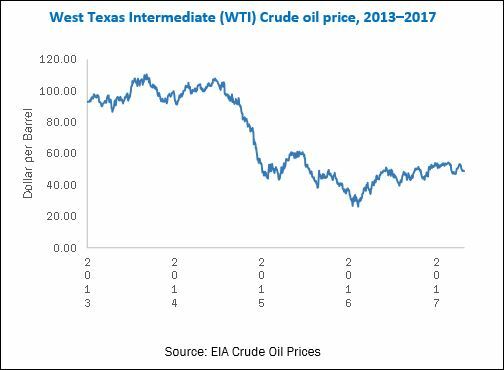 The current year, 2018, is witnessing fairly stabilized crude oil prices around USD 70 a barrel bringing alive the upstream spending to an extent. 10.6 National Oilwell Varco, Inc.
10.9 Expro International Group Holdings, Ltd.
10.12 Trican Well Service, Ltd.
10.14 Basic Energy Services, Inc.
10.16 Pioneer Energy Services Corp.
10.25 Calfrac Well Services, Ltd.
10.26 Key Energy Services, Inc. Figure 17 Natural Gas Production in China, Canada, and the U.S.